What’s 16 metres long, weighs 10 tonnes and has 500 metres of pipe snaking through it? 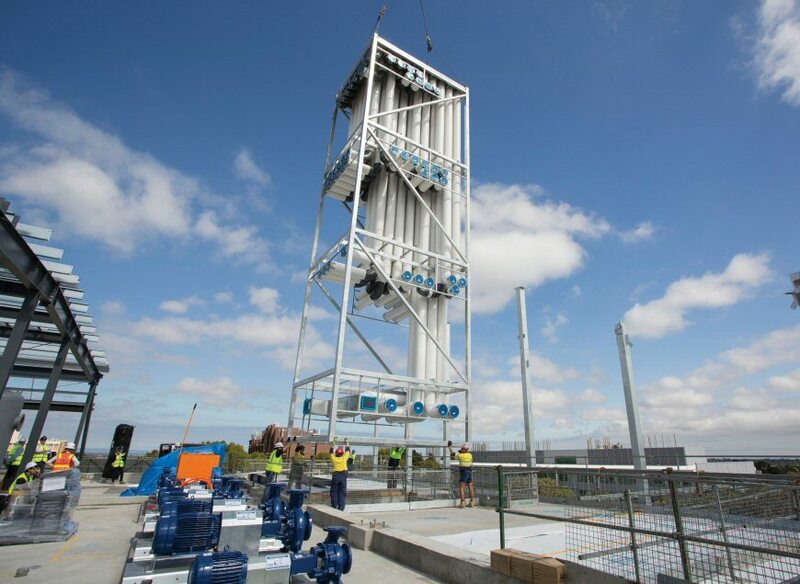 Answer: AE Smith’s latest prefabricated module installation success story for Lend Lease at the $80 million, 9,500 sqm, Green Chemical Futures (GCF) multi-level facility under construction at Monash University’s Clayton Campus in Melbourne. Driven by innovation and the desire to constantly find new ways to help our customers find the right outcome, the Victoria Construction AE Smith team challenged current thinking about the wisdom of stacking multiple, small prefabricated modules together to achieve multi-storey heights. Reduction in onsite health and safety risks. And that’s exactly the type of benefits Lend Lease was looking for at the Monash University GCF build to help them overcome a unique problem. 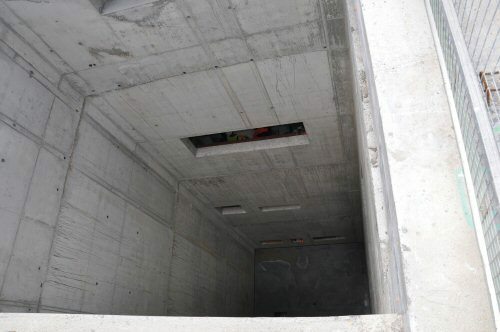 “The project involved the installation of eighty fume cupboard PVC exhaust ducts within a concrete shaft rising through the building from ground level to the level four plant room space,” explains Gary. “AE Smith approached Lend Lease early to discuss what options, if any, there were for the installation of the services and if any provisions for access could be provided. It quickly became evident that prefabrication of the services riser was the only viable option available,” said Gary. 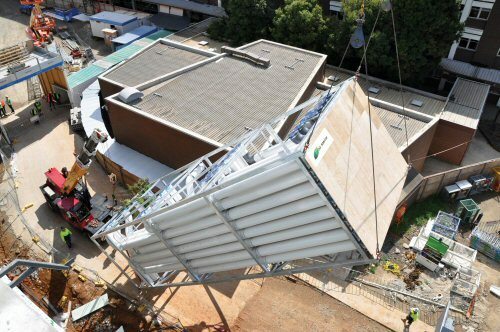 At approximately 16 x 5 x 4 metres in size, 10 tonnes in weight, containing a 500m labyrinth of PVC duct work, the giant prefabricated module riser was lowered vertically into place this March with millimetre accuracy inside its hollow concrete receptacle spearing the building. The production of the structurally certified steel frame for the prefabricated module proceeded quickly with the installation of PVC duct inside the frame completed under cover and in a controlled environment. 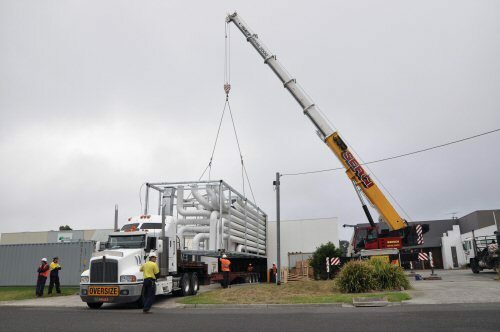 After securing all the necessary permits to transport the over-sized wide-load between AE Smith and Monash University, it was an uneventful 30 minute transfer lying flat on the back of a low-loader truck. Once onsite at GCF, the large prefabricated module was carefully manoeuvred into position on the ground before being lifted by crane. Installation of the module took a mere twenty minutes – a sight to behold for the many spectators that amassed. “Prefabrication of the mechanical riser has resulted in significant gains to the construction programme and certainty in the quality and delivery with the fabrication of the riser commencing prior to the completion of the in situ concrete shaft and simply slotting in place. 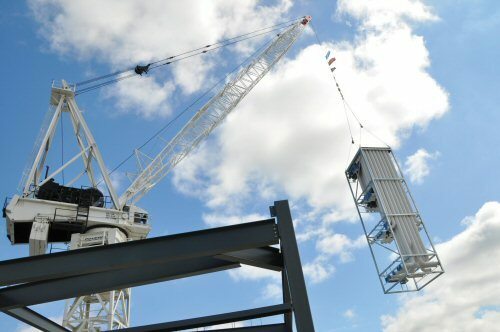 However most importantly the prefabrication of the riser at ground level has negated the need to construct the riser at heights; a much safer method of construction,” explains Dim Jancev, Lend Lease GCF Construction Manager. “Thank you to Gary and the AE Smith team. The collaboration and innovation shown by the team has resulted in significant gains to the construction programme as well as ensuring best practice safety practices were adopted,” said Dim. 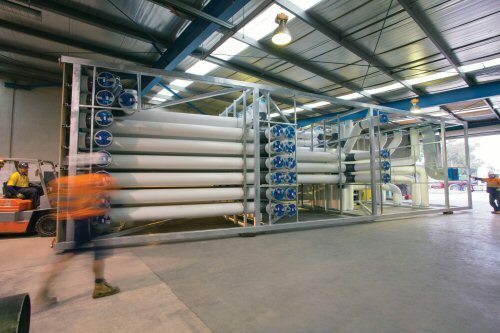 AE Smith have invested and continue to invest heavily in prefabrication techniques and technologies that help our customers compress the critical path of their project. Lady Cilento [Queensland] Children’s Hospital Energy Plant, Brisbane.